Do you have a place that just "feels like home"? even if you're not looking for anything in particular? Leola's Vintage Home and Garden in Ozark, Missouri is one of those places. Many of you know Jan from her blog Summer Sundays. She has been my blog mentor and dear friend for this last year. 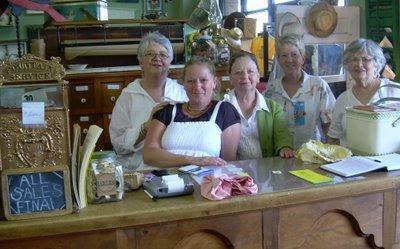 She and her sisters , Judy and Linda, and neice Kelli, are the owners of Leola's, which is named for the sisters' mom. Jan, Kelli, Judy, Linda and their sister, Jean, on the far right. Come on in. This is what greets you this week. The store is constantly changing, with new displays and vignettes. Since I want to share all my photos, I will post more next week. If you are in southwest Missouri, stop by for a real treat. Ozark is a quaint little town between Springfield and Branson. 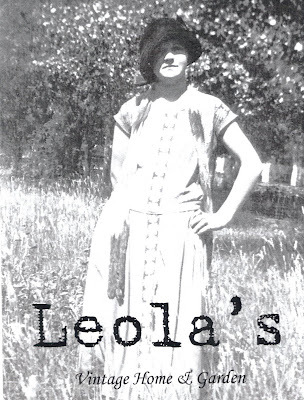 Leola's is located right behind Lamberts Cafe, CC and Highway 65. Some day I so hope to make it up that way. Just beautiful! Happy 4th!! Who's the talent sewing the slipcovers? I love them and that wonderful figural lamp!!! Great store and aren't you a doll for posting so many wonderful photos. I haven't had the honor of meeting Jan, but I can tell from comments she is one sweet lady! My mother in law lives in Springfield and we tried to go to Leola's last time we visited, but it was closed all week to get ready for their Christmas Open House. I was so bummed! Maybe next time! P.S. Thanks for the ideas for my bathroom!